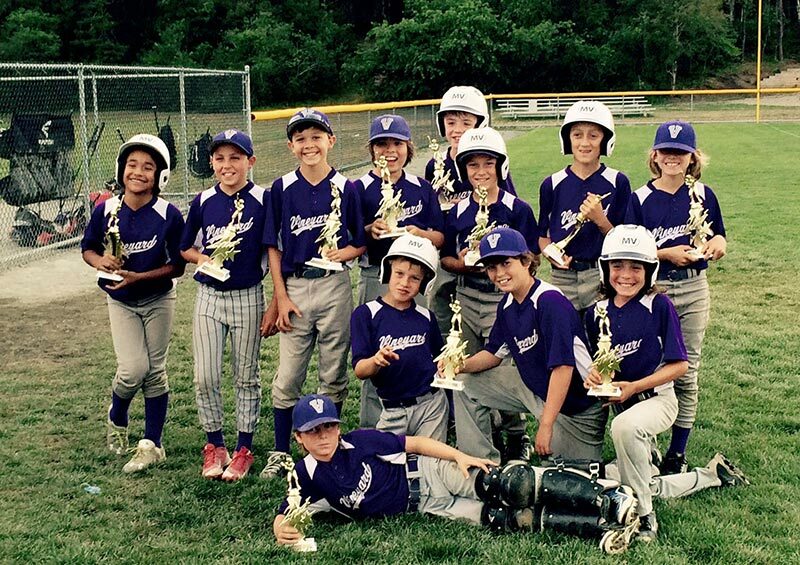 The Martha’s Vineyard U10 Baseball All-Stars competed in Barnstable’s esteemed Lorusso Cup tournament from Thursday to Sunday, July 23–26, and came away with a runner-up trophy in a very tight 2-1 loss to Bourne in the championship game. In the first game, played on Friday night, Martha’s Vineyard lost 6-3 to a good Barnstable 2 team. Determined to come out strong, the team headed into a doubleheader on Saturday. MV beat Harwich-Chatham 17-1 in 4 innings, then faced Falmouth. Falmouth and the Vineyard had played five times over the past two years. Falmouth won them all. MV finally got the proverbial monkey off its back, and beat Falmouth 7-4. Next step was for the squad to get its first-ever playoff win. In the Sunday playoffs, the Vineyarders drew a rematch with Barnstable 2 to start the day. They quickly fell behind 4-1, but stormed back to win 9-4, and moved on to the semifinals. Facing the No. 1 seed Brewster, MV jumped out to a quick lead, and held them off 5-3 to reach the championship game. It was an old school championship game. Pitching and defense ruled the day, making this one a nail biter for six innings. The 2-1 victory went to Bourne. Sportsmanship also ruled the day, with ample congratulations, handshakes, and smiles all round by the players, coaches, and parents from both teams, following what all agreed was a competitive and well-played game. The MV U10 Baseball All-Stars play their final tournament of the year from Friday, July 31, to Sunday, August 2, in Bourne, and look forward to a rematch.